Devadeva Mirel runs a wonderful mail-order organic jam and preserves company. If I was living in the USA I would definitely order some in. I might still try to get some. 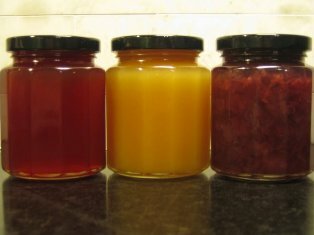 Golden Crabapple Jelly, Rose Petal Jam, Quince Jelly, Anise Plum Jam, Elderberry Syrup, Saffron Cardamom Peach Jam, Vanilla Bean Peach Butter, Gooseberry Jam, and Hot & Sweet BBQ Glaze.